For use with Dana Model 44 rear axle. 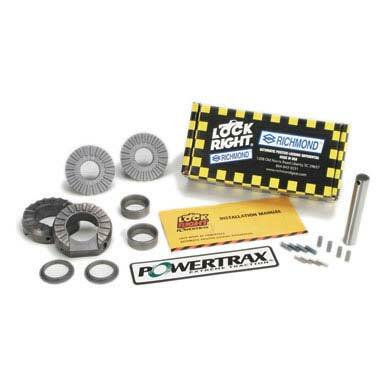 Installation consists of replacing some of the standard parts in your differential case with Lock-Right. The complete job can be done in the average small shop in about 4 hours. Installing a Lock-Right in the differential case, once it has been removed from the vehicle, takes only about an hour. Manuals that give driving and safety tips, along with detailed installation steps are included. If the instructions are carefully followed, the backlash and bearing pre-load will not have to be reset. The Lock-Right parts include two heat-treated high carbon steel drivers, two heat-treated high-carbon steel couplers, four hardened steel stop pins, support pins, four stainless steel bias springs, and disc when required, and two steel spacers. Fits Dana Model 44 Rear Axle, 30 Spline. 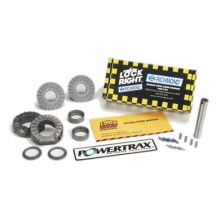 Kit includes high performance cross shaft. Will not work with Factory Trac-Lock (Posi-Traction) differential case.